What better character to hawk a house slathered in animal dung than a leather-jacketed agent from Rockstar Real Estate Group? Rhinestone-loving Paul Gomberg, who operates under the umbrella of Keller Williams Conroe/Lake Conroe, posted a video tour yesterday of a house featured on Swamplot on Monday (which, as commenters noted, included captions such as “Feces galore!”). Gomberg seems eager to share his delight for the house at 5623 Willow Walk Ln., calling it “one of the best listings he’s had in the last 2 weeks” (even while warning his cameraman to hold his nose against what his HAR listing calls the “foul stench” permeating the interior). Gomberg posted the tour to YouTube last night — despite the fact that the property appears to have been under contract since December 20, after only 1 day on the market. The real story is what became of the homeowner who sits on the Texas Funeral Commision Board? Lol. That guy is terrific. Of all the things, the one thing that bothers me the most is that pipe between the cage and window into the house. WTLF would that be for? Disturbing. Lykos, I assume that the pipe/cage contraption is a homemade way for an indoor cat to spend time outside safely. One could debate which is worse, a walk through the poo poo filled house or sitting through a set of Mr. Gomberg’s musical stylings. And the guy could have probably got an extra $10k on the selling price if he paid $500 to have someone take out all the trash and pull up the poo covered carpets. Looks like a pretty obvious squatter situation here, and it sometimes takes a while to get the inhabitants evicted. It’s almost hard to believe the home got this bad in just three years’ time. In a cage that is taller than it is wider? You gotta be kidding me. OMG! I knew I recognized this layout. In middle school my best friend and her family lived in this house. I’m sure they’re the ones who sold it in 2012. How sad that the new owners destroyed it. I have many a fond memory of this house. Not very funny as this was certainly a mentally ill persons home. That is a very biohazardous environment. Gombie and his cameraman should’ve been wearing hazmat gear. The guys who clean the mess up will be. Wow, that’s really sad. That’s definitely a case of mental illness. Seems like it could be a pretty good investment. The actual hard costs to get this livable again look like nothing more than carpet and interior paint. A crew of 3 with hazmat suits and respirators could have the house cleaned in a day or two. Way more work than that to make it liveable again. You’ve got to fill two dumpsters with trash, rip out the carpet, probably all the sheet rock at this point to get rid of the urine smell that is probably in there, bleach clean the studs, probably sand and refinish the wooden floors downstairs to address pet stains. The bathrooms could use an update. Still though, good profit at that price, but I’d say you’ve three to four months work to get it onto the market. Plus however much it costs to get a hacker to remove all internet traces of this listing and the photos. @MikeH: A little Febreeze will fix it right up. Did the Seller of the (previously) lovely home de-list it, forget about it (or died) and then squatters moved in with a whole lot of animals? Was owner unable to sell, de-listed the place and then fell into a mental health abyss, eventually living with a whole lot of animals? Begs question: Where is homeowner? Gotta know more about that pipeline to the cage out back….. The real shame is that much of this insanity that is all too common in Houston *could* be prevented. Unfortunately most aren’t able to recognize the mold infestation after a flood, leaky faucet, or AC malfunction. Three months later the whole place is filled with toxic mold spores that cause varying degrees of psychological illness. Waking up at 3 AM with your heart racing and nightmarish thoughts? Yep that’s mold toxin in your blood. The real unfortunate thing is that once the mold is in place it’s very difficult to remove and the home (and this city full of insane mold-inhaling individuals) accumulates even more toxins. No one will fault an agent for selling a moldy home though even if that mold is far more toxic than any remaining animal excrement. How much is this listing? That’s an outdoor cage connected to the house by a tube. 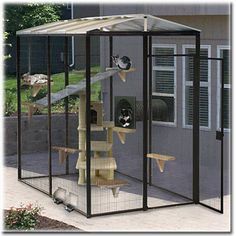 They’re commercially available, for people who want to let their cats outside without letting them loose.